Researchers using the NASA/ESA Hubble Space Telescope recently took advantage of a rare opportunity to record Saturn when its rings are edge-on, resulting in a unique movie featuring both of the giant planet's poles. Saturn is only in this position every 15 years and this favourable orientation has allowed a sustained study of Saturn’s almost symmetric northern and southern lights. An enormous and grand ringed planet, Saturn is certainly one of the most intriguing bodies orbiting the Sun. Hubble has now taken a fresh look at the fluttering aurorae that light up both of Saturn's poles. It takes Saturn almost thirty years to orbit the Sun, with the opportunity to image both of its poles occurring only twice in that period. 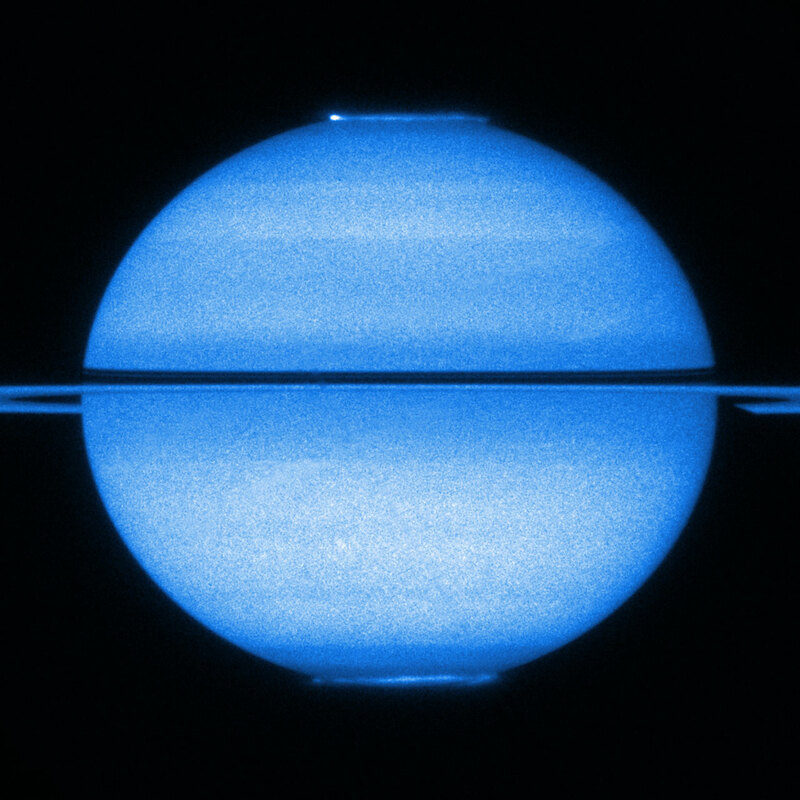 Hubble has been snapping pictures of the planet at different angles since the beginning of the mission in 1990, but 2009 brought a unique chance for Hubble to image Saturn with the rings edge-on and both poles in view. At the same time Saturn was approaching its equinox so both poles were equally illuminated by the Sun's rays . These recent observations go well beyond just a still image and have allowed researchers to monitor the behaviour of both Saturn's poles in the same shot over a sustained period of time. The movie they created from the data, collected over several days during January and March 2009, has aided astronomers studying both Saturn's northern and southern aurorae. Given the rarity of such an event, this new footage will likely be the last and best equinox movie that Hubble captures of our planetary neighbour. Despite its remoteness, the Sun's influence is still felt by Saturn. The Sun constantly emits particles that reach all the planets of the Solar System as the solar wind. When this electrically charged stream gets close to a planet with a magnetic field, like Saturn or the Earth, the field traps the particles, bouncing them back and forth between its two poles. A natural consequence of the shape of the planet's magnetic field, a series of invisible "traffic lanes" exist between the two poles along which the electrically charged particles are confined as they oscillate between the poles. The magnetic field is stronger at the poles and the particles tend to concentrate there, where they interact with atoms in the upper layers of the atmosphere, creating aurorae, the familiar glow that the inhabitants of the Earth’s polar regions know as the northern and southern lights. At first glance the light show of Saturn's aurorae appears symmetric at the two poles. However, analysing the new data in greater detail, astronomers have discovered some subtle differences between the northern and southern aurorae, which reveal important information about Saturn's magnetic field. The northern auroral oval is slightly smaller and more intense than the southern one, implying that Saturn's magnetic field is not equally distributed across the planet; it is slightly uneven and stronger in the north than the south. As a result, the electrically charged particles in the north are accelerated to higher energies as they are fired toward the atmosphere than those in the south. This confirms a previous result obtained by the space probe Cassini, in orbit around the ringed planet since 2004. The equinox identifies one of the two moments during a planet's journey around the Sun when the light rays coming from the star are perpendicular to the planet's equator. On Earth, we are familiar with the spring and autumn equinoxes, two special dates in the calendar when day and night have the same length everywhere on the globe. Just like equinoxes on Earth, which occur twice in a yearly orbit, Saturn also has two equinoxes per orbit. However, Saturn takes almost 30 Earth years to orbit the Sun, thus experiencing an equinox every 15 of our years.